The Stag 2017 European Youth Championships continues to deliver plenty of exciting action for fans in the Portuguese city of Guimarães, as spectators witnessed dramatic Round of 16 encounters in the junior team events on Sunday 16th July. Julia Slazak was the star player for Poland in the last 16 of the Junior Girls’ Team tournament, registering vital victories over French opponents Nolwenn Fort (11-9, 11-9, 11-9) and Lucie Gauthier (11-7, 11-7, 11-7). Despite a good showing from Lucie Gauthier in her fixture against Anna Wegrzyn, France was left devastated with Julia Szymczak defeating Romane Le Scour across four ends (8-11, 11-7, 11-6, 11-5) as Poland claimed a 3-1 win to move through to the quarter-finals. Last year at the 2016 edition of the competition Serbia beat Croatia in the last eight of the Junior Girls’ Team category. The two teams met again at the 2017 tournament but this time in the last 16, and yet again a similar outcome emerged. Tijana Jokic praised teammate Sabina Surjan after the match following her fine performance against Andrea Pavlovic (12-10, 5-11, 11-7, 10-12, 11-6). “We were under pressure, because we had to repeat the success from last year and to prove it did not come as an accident. The most important thing today was to stop Andrea Pavlovic. Sabina Surjan successfully fulfilled the task in the opening match… After that it was easy!”, Tijana Jokic. Champions Romania takes on the Czech Republic at the very top of the quarter-finals draw, while the fixture at the bottom of the draw sees Russia and Slovenia going head-to-head. Poland faces a tough fixture with Azerbaijan, and Serbia does battle with Spain. There were celebrations for Greece in the Junior Boys’ Team competition on the third day of play in Guimarães, following the team’s 3-2 success against last year’s runners up Czech Republic. Ioannis Sgouropoulos saw off Jan Valenta (11-7, 11-3, 11-7) and Jiri Martinko (11-8, 11-9, 11-4) to keep the Greek team in the match, before Georgios Stamatouros brought the tie to a close with a four games win against Czech player Valenta (11-8, 8-11, 11-7, 11-6) in the decider. “It is the first time for us to play for a medal. We are so excited! Now we will meet Sweden, but we believe we can win. They are favourites, but we will fight. 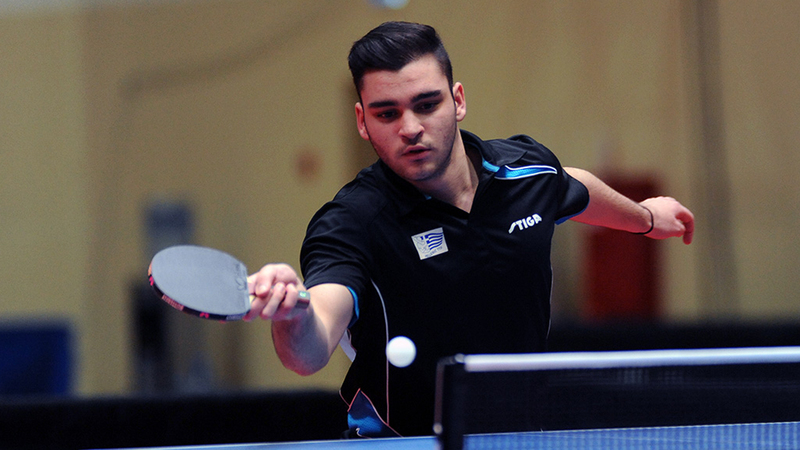 I feel confident, especially with my backhand and footwork”, Ioannis Sgouropoulos. Germany is through to the quarter-finals after a good outing against Slovenia. Tobias Hippler gave the Germans the early advantage with a positive effort against Tilen Cvetko (14-12, 11-13, 11-8, 11-7) prior to victories from Gerrit Engemann and Cedric Meissner over Peter Hribar (12-10, 9-11, 11-7, 11-7) and Luka Norcic (11-8, 11-6, 11-6). Sweden awaits Greece in the last eight while Germany encounters Italy. The remaining quarter-finals fixtures sees Belgium meets Russia , and France faces Romania.